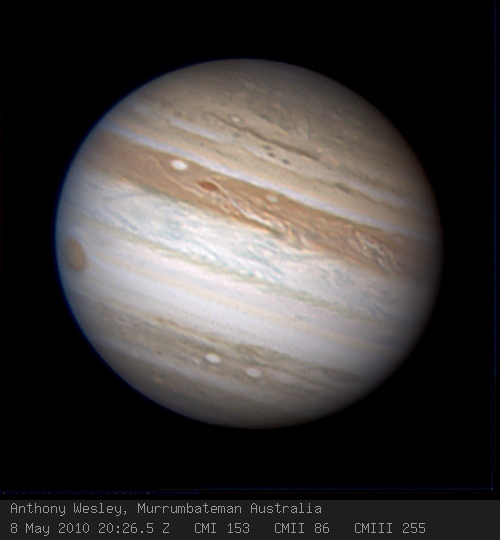 The May 25 edition of the ALPO Jupiter Newsletter is now online. Please see the latest update to Mars observations called “Observations of the NPC fragment Cercropia” See the update here or visit the Mars section website. Announcing the 2010 Association of Lunar & Planetary Observers Conference! If you have difficulty opening any link, please contact Larry Owens. An ALPOD has been posted for May 2010. This is another excellent image by Anthony Wesley (Bird). With increased interest in Firewire cameras for planetary imaging, I’ve just added 2 links to a capture program called FireCapture, created by TorstenEdelmann. The “beta” link is for a new version that supports PointGrey Research cameras such as the Flea3. Please access these links under “Image Acquisition” in the right sidebar of our site.